This week’s Ten Questions brings a visit from New York Times and International Best Selling author, Jenna Blum. 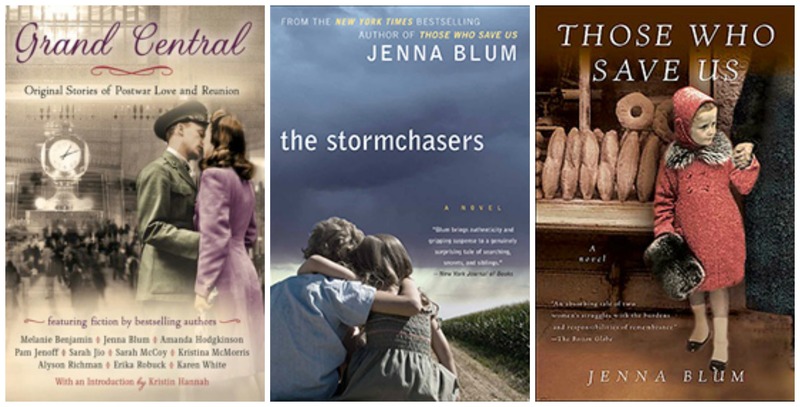 Ms. Blum is the author of Those Who Save Us, The Storm Chasers, and a story in the Grand Central Anthology. Jenna Blum: That’s a good question. My most recent favorite word is “crenelation,” about the snow castles here in Boston [BD: This interview was done in the winter of 2015 when Boston was under many feet of snow]. My first favorite word: “inchitate,” as in “Don’t inchitate me” (I meant irritate. I was 2 years old). JB: Congrats. If you want to wholeheartedly congratulate somebody, for goodness’ sake, take the time to spell the damned thing out! BD: What turns you on creatively? JB: Bad grammar. (I used to use bad grammar as a sieve for dating candidates.) Also incivility. JB: My black Lab jumping into the water–SPLOOSHO! So joyous. Also my fiancé’s laugh. JB: Music I haven’t chosen, especially rap, played too loudly. Bass. JB: We used to play this game at dinner parties! “What career would you have that involves a lot of training, besides your own?” Broadway singer. JB: Any office job. I had an office job once. For one day. Then I called and said I had mono. JB: Anything with SEA SALT CARAMEL frosting. You can have the cake. I will take the frosting. Thank you for joining us, Jenna! If you’re interested in learning more about Jenna and her novels, she can be found on her website, Facebook, and Twitter.